Happy National Deep Dish Pizza Day! Being from Chicago, this might just be my favorite holiday, ever! Here’s a fun fact– when I was in grade school my parents owned a pizza place called Sarcinella’s pizza. It was absolutely amazing and to this day my dad still makes the best pizza around. Don’t give this Chicago girl a thin crust pizza, no thank you! For me it’s all about the deep dish. For Christmas every year we have Lou Malnatis shipped to the house to enjoy. It’s a great tradition and makes cooking and cleaning that night a breeze so we can focus on family. This Italian girl loves pizza but obviously indulging in it as much as I would like doesn’t fit into my diet plan. That’s why I’ve started trying the cauliflower pizza crusts. However, the ones at the store are better than regular crust, they still have some ingredients in them I don’t love, so I’ve been making my own. It’s very simple and turns out great when you do thin crust. I wanted to try a deep dish though just to see what would happen. 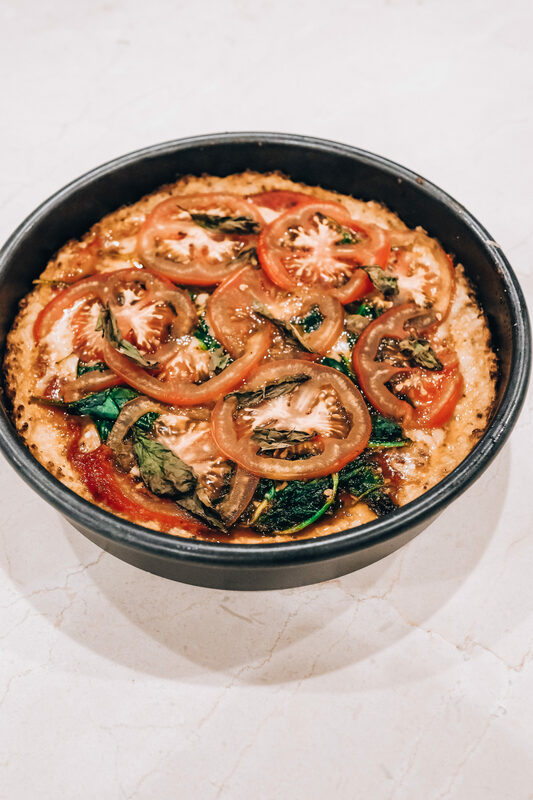 Well… I’m not going to sugar coat it– it doesn’t taste like biting into a piping hot Chicago style deep dish pizza but actually all in all it’s not bad as long as you know it’s not going to taste just like the real thing. Preheat your oven to 425 degrees. Steam the two bags of riced cauliflower in the microwave. Once finished, transfer the cauliflower to a pan and saute to get out all of the remaining moisture. 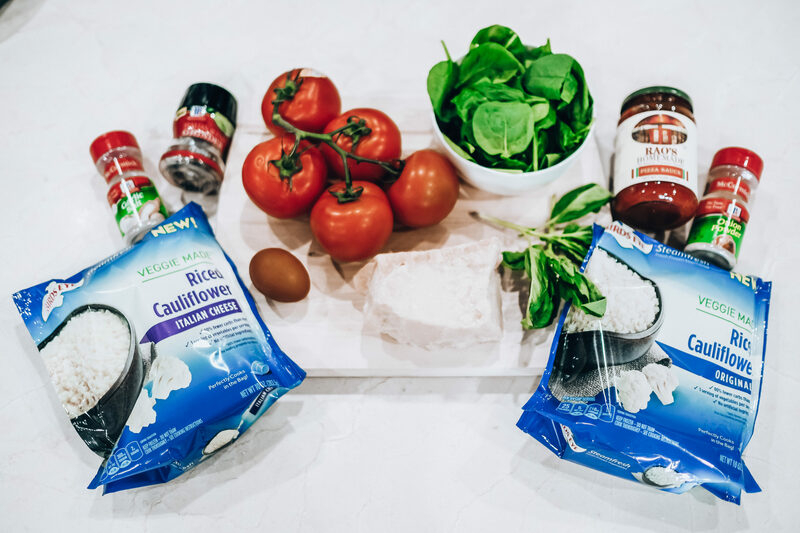 After the cauliflower is sauted, put in a mixing bowl and mix in two eggs, about 1 and ½ cup parmesean cheese and season with Italian seasoning, garlic salt and onion powder (add as much or as little as you prefer) and mix well. Add “dough” to pizza pan and put into oven for about 15 minutes. While the crust is baking, prepare the toppings of your choice (I used fresh parmesean, tomatoes, spinach and basil). After the crust is finished, add toppings and bake for about 15 more minutes. Remove from oven and serve!